I have already shown some examples of battle panoramas. Long before the advent of the panorama, painters have been trying to tell the stories of battles and wars. This article looks in more detail at a small selection of works showing these from the 1800s up to the Second World War. War Artists, official and unofficial, can work in any of the genres, but they are generally most effective and influential in history painting, with its inevitable narrative. In November 1807, Napoleon’s armies occupied Spain and fought the Spanish in the Peninsular War. The people of Madrid rebelled on 2 May 1808, in an uprising which led to fierce battles. The following day, before dawn, the French forces rounded up and shot hundreds of the rebels at various locations in Madrid. Francisco Goya (1746–1828), El Tres de Mayo (The Third of May) (1814), oil on canvas, 266 x 345.1 cm, Museo del Prado, Madrid. Wikimedia Commons. Goya’s depiction of this is one of the great paintings of Europe, and is discussed extensively in Wikipedia. From a narrative viewpoint, it not only follows Alberti’s rules, but is exemplary, as seen in the detail of the Spanish prisoners about to be executed. 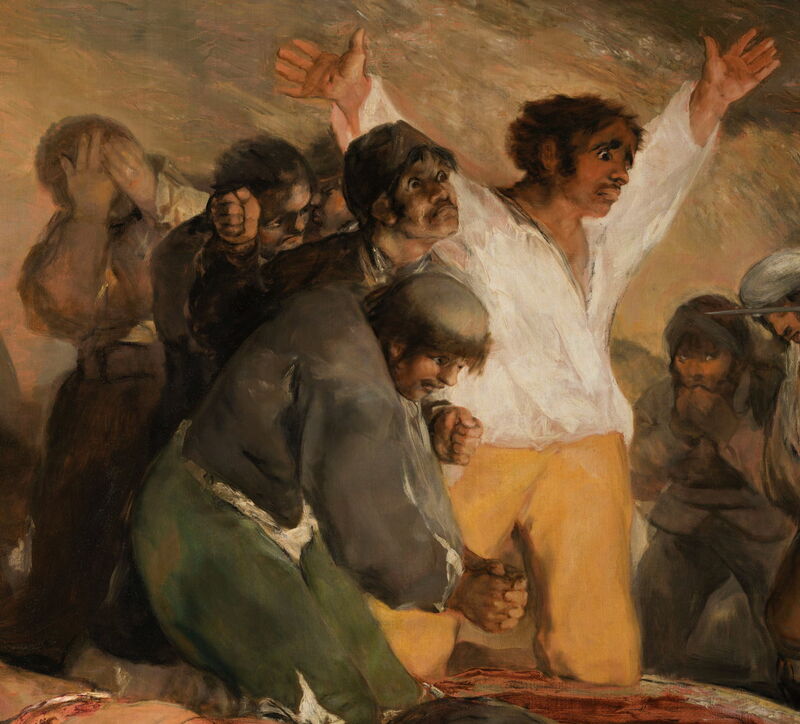 Francisco Goya (1746–1828), El Tres de Mayo (The Third of May) (detail) (1814), oil on canvas, 266 x 345.1 cm, Museo del Prado, Madrid. Wikimedia Commons. Facial expression and body language are at their peak in the prominent figure wearing the white shirt. He is strongly supported by the other victims, and the blood and corpses at their feet make it abundantly clear what is about to happen to them. This classical approach to the narrative of an execution by firing squad contrasts with Manet’s The Execution of Emperor Maximilian of Mexico (1868) shown and discussed here, and with Gérôme’s The Death of Marshal Ney (1868) shown and discussed here. 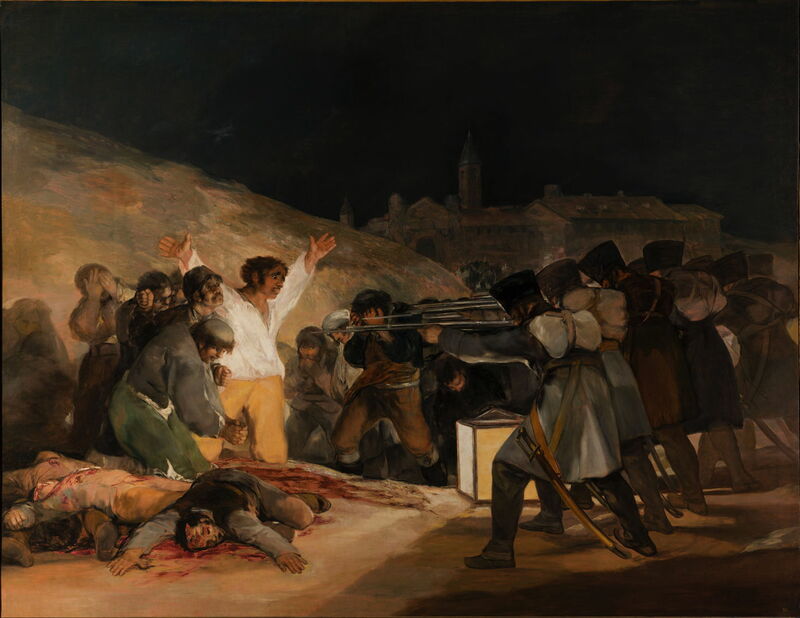 The most immediate difference is timing of the depiction in the painting: Goya opts for the moment before the shots, which is the instant of greatest drama; Manet prefers a few moments later, when the shots have just been fired, which is technically the climax; but Gérôme waits until the body is well dead and the squad marching away, for maximum coldness and detachment. Being paintings, the viewer is then left to imagine the narrative prior to and after the instant shown. Rather than showing military action from the Franco-Prussian War of 1870-1, Detaille here makes a direct political statement. Showing a group of young conscripts just before reveille, when on exercise probably in Champaign, he paints their (imaginary) collective dream of previous battles, spread across the coloured clouds of the dawn sky. This ‘flashback’ technique sided with the rising militarism and thirst for righting the wrongs which the Franco-Prussian War had done France, and the following year conscription was introduced. The painting was awarded a medal, was bought by the French state, and presented at the 1889 World Fair. Its huge canvas is now one of the less popular works on display in the Musée d’Orsay in Paris. 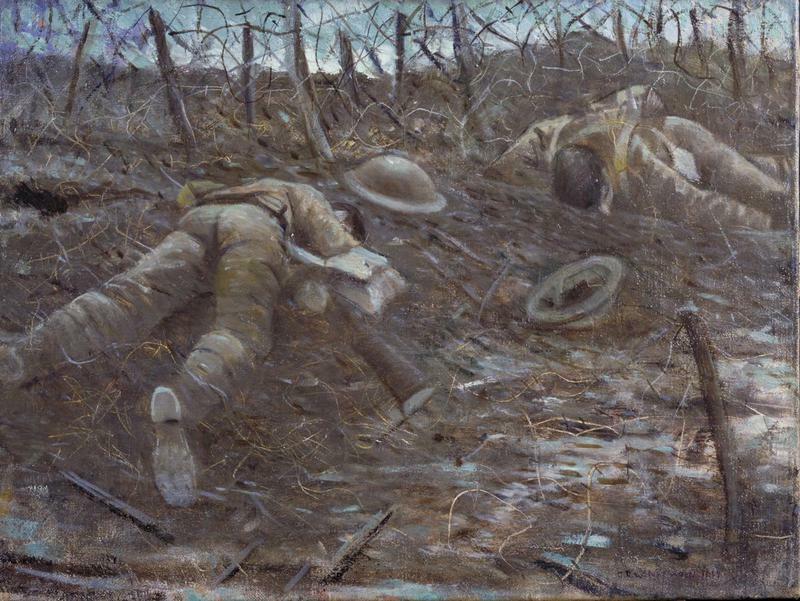 Nevinson leaves the viewer to construct their own narrative of the deaths of these two soldiers behind the Western Front, and to draw their own conclusions. Its frank depiction of two of the more than 5.5 million Allied (and 4.3 million Central Powers) dead was judged too much by the official censor. Nevinson therefore exhibited the painting with a brown paper strip across it, marked ‘censored’, for which he was reprimanded. As is so often the case, this created greater publicity. John Singer Sargent’s unusually large canvas has a more explicit but equally damning narrative. Mustard gas attacks were used in the Western Front in August 1918, just three months before the end of the war. Here a group of blind and injured soldiers from an attack are led to medical aid in the Corps dressing station. Just visible in the distance, behind the wounded soldiers, a football match is in progress. Sargent’s classical training equipped him well to undertake history and other narrative painting, although he seldom did either, preferring landscapes for pleasure and portraits to pay the bills. His time as a War Artist encouraged his narrative work, and he showed himself to be as skilled with such stories as in other genres. Because of copyright restrictions, I am unable to show an image of Picasso’s painting, which can be seen here. This street mural in Santiago de Chile is the closest that I can offer, I am afraid. On 26 April 1937, during the Spanish Civil War, the German Air Force’s Condor Legion and the Italian Aviazione Legionaria destroyed the Spanish Basque town of Guernica, killing hundreds, maybe over 1500, of its civilian population. Although apparently part of a military campaign, the bombing is seen as a singularly vicious attack on civilians to provoke terror and submission. 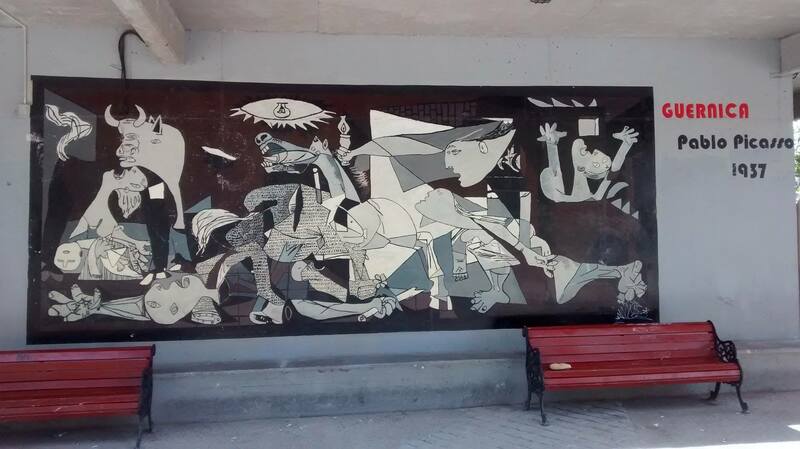 Picasso was commissioned by the Spanish Republican government to paint a large mural in January 1937, before the attack took place, and completed this in June 1937. It was first exhibited at the 1937 World’s Fair in Paris. Picasso maintained that it is not up to the painter to define the symbols, and so left it up to the viewer to interpret what he painted here. Unfortunately he did not follow the previously established conventions of narrative painting, and there are numerous interpretations of the puzzle which he has left us. Its dominant elements are not aircraft, bombs, or widespread material destruction, but a bull and a horse, which are apparently to be interpreted symbolically, in the context of Spanish culture. They, and other recognisable objects in this monochrome painting, such as the light hanging above it, and many fragmented and contorted body parts, have been interpreted in various ways, some of which are detailed in this excellent Wikipedia article. Despite this lack of direction or consensus on the meaning of elements within the painting, or the narrative of the painting as a whole, it is generally accepted as being the leading example of narrative painting of the twentieth century, one of the most important paintings of ‘modern art’, and a key image in the expression of revulsion against war. Paul Nash (1892–1946), Battle of Britain (1941), oil on canvas, 122.6 x 183.5 cm, The Imperial War Museum, London. By courtesy of The Imperial War Museums © IWM (Art.IWM ART LD 1550). From the end of June 1940 for four months, the German Luftwaffe (Air Force) and the British Royal Air Force fought a succession of intense air battles over the UK, mainly the south and east coastal areas. This startling distant view incorporates many elements of air warfare, including vapour trails (contrails), smoke marking the spin and crash of a downed aircraft, formation flight, and defensive airships. Below this action are the low hills, estuary, and a winding river typical of much of the English south coast. 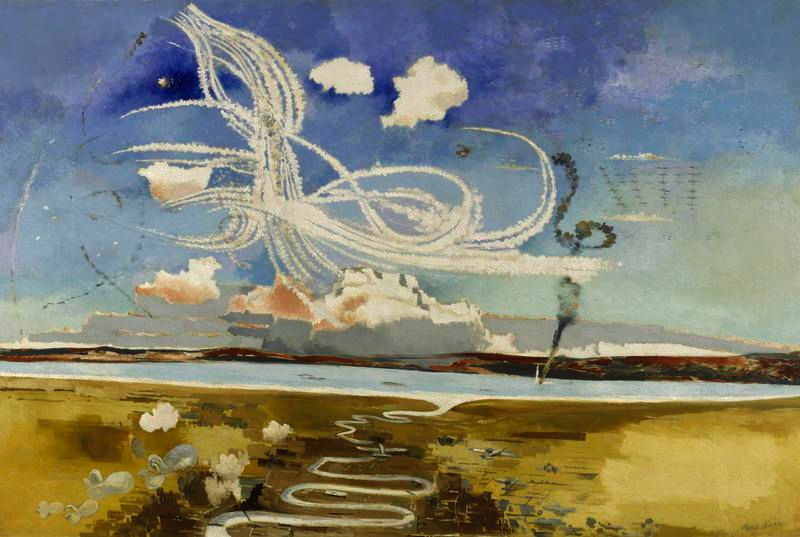 Paul Nash increases the distance from this air war by emphasising the forms and patterns made in the sky, and by making his view from high above the ground. This does not make it more abstract, but detaches the story of the battle from the people involved. Paul Nash (1892–1946), Defence of Albion (1942), oil on canvas, 121.9 x 182.8 cm, The Imperial War Museum, London. By courtesy of The Imperial War Museums © IWM (Art.IWM ART LD 1933). 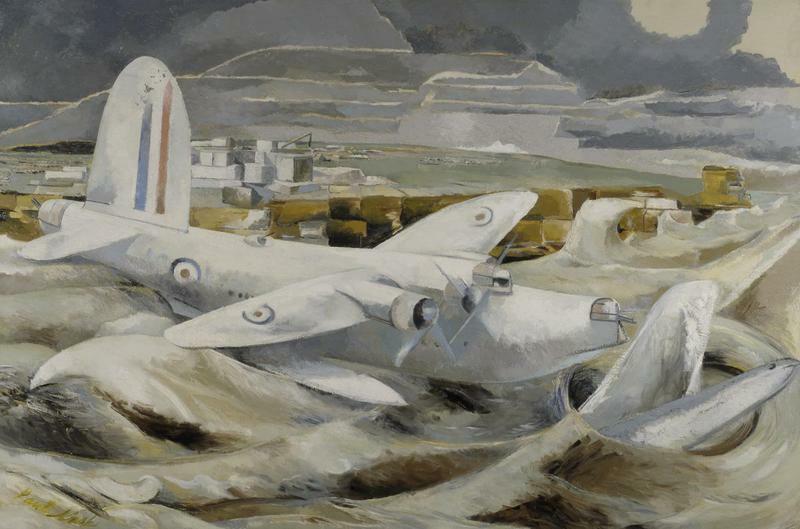 Painting from another aerial location, Nash shows a Sunderland ‘flying boat’ operating in rough seas off the Portland, Dorset, coast; cues for the location are given by the large blocks of limestone from the quarries in the distance. Among the duties of these aircraft were anti-submarine patrols, and part of a German U-boat is shown in the right foreground to emphasise this (in an unreal composite). Again Nash distances the viewer from any human elements by concentrating on the machinery of war. Stanley Spencer (1891-1959), Shipbuilding on the Clyde: Bending the Keel Plate (detail) (1943), oil on canvas, 76.2 x 579.1 cm, The Imperial War Museum, London. By courtesy of The Imperial War Museums © IWM (Art.IWM ART LD 3106). Stanley Spencer spent much of his time during the Second World War studying, sketching, and painting civilian work in the shipbuilding yards of the Clyde, near Glasgow, Scotland. This resulted in a huge installation of paintings, showing the stages of construction of warships there, and the many crafts and skills exercised by the people who laboured on them. Here four men are manoeuvring a suspended steel sheet to form part of the keel, whilst others watch, or work on related tasks. He uses their body language to show the effort and teamwork involved, creating a rare tribute to the civilian work involved in making the machines of war. Together these paintings constitute a modern and industrial form of narrative panorama. The American war in the Pacific included a succession of intense and bloody amphibious assaults on small islands. One of the most controversial was that of the tiny island of Peleliu by the US 1st Marine Division. Over a period of two months, 1794 of its men were killed, although the island appears to have had little strategic value. 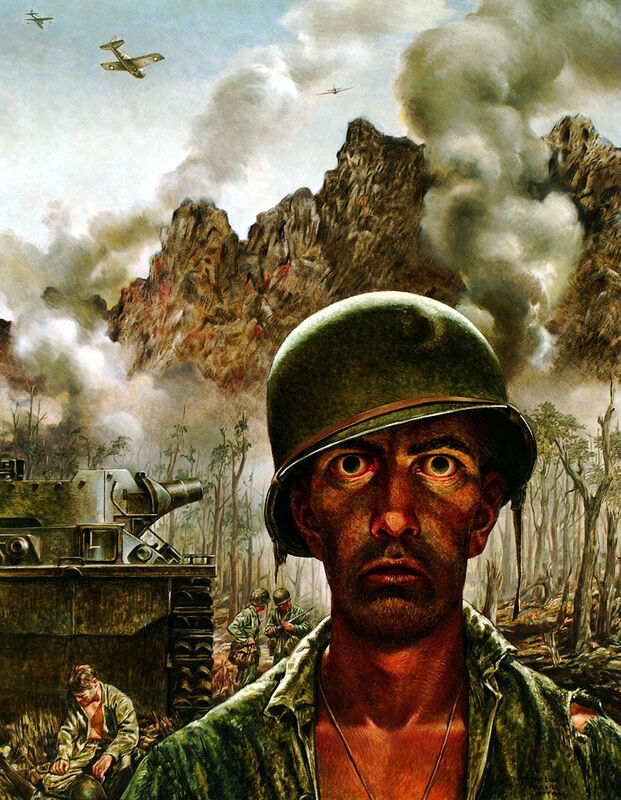 Tom Lea here relies almost entirely on the horrifying, staring facial expression of the Marine in the foreground, who has clearly not slept for weeks, and is brown from the sun and accumulated dirt. Behind him the forest has been all but destroyed, and a harsh rock ridge rises to the fighter planes above. The ridge appears stained with the blood of the casualties. This painting became famous when it was published in the widely-read news magazine LIFE. 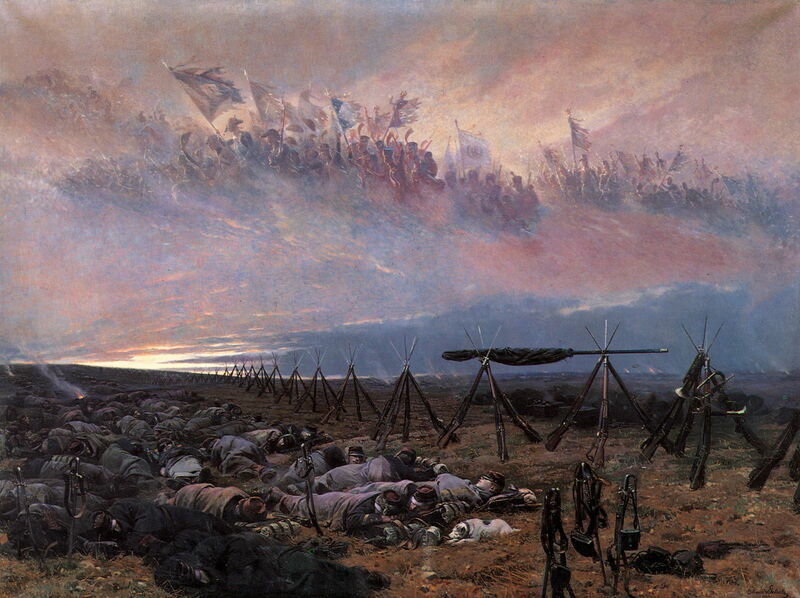 Those who have painted depictions of war have taken differing approaches to their narrative. As we have seen elsewhere, those which have followed Alberti’s ‘rules’ have generally succeeded in showing clear and effective human stories, which have made great works of art. Some of these have been significant influences over society’s attitudes to war. Attempting to build narrative from the machines of war, far distant from the people involved, has resulted in strange and detached stories which, lacking the human element, feel cold and unreal. Picasso’s peculiar symbolic narrative has driven a consensus of opinion about war, but its story remains unresolved and controversial. As tools of narrative, his symbols appear to obscure rather than enlighten; as a result his painting can only tell a personal story to each individual viewer. Instead of resolving problems in narrative painting, it poses even more. Posted in General, Painting and tagged Detaille, Goya, Guernica, Lea, narrative, Nash, Nevinson, painting, Picasso, Sargent, Spencer, war, war artist. Bookmark the permalink.